I have been interested in the problem of mechanical and human flight ever since as a boy I constructed a number of bats of various sizes after the style of Cayley's and Penaud's machines. My observations since have only convinced me more firmly that human flight is possible and practicable. It is only a question of knowledge and skill just as in all acrobatic feats. Birds are the most perfectly trained gymnasts in the world and are specially well fitted for their work, and it may be that man will never equal them, but no one who has watched a bird chasing an insect or another bird can doubt that feats are performed which require three or four times the effort required in ordinary flight. I believe that simple flight at least is possible to man and that the experiments and investigations of a large number of independent workers will result in the accumulation of information and knowledge and skill which will finally lead to accomplished flight. The works on the subject to which I have had access are Marey's and Jamieson's books published by Appleton's and various magazine and cyclopedic articles. I am about to begin a systematic study of the subject in preparation for practical work to which I expect to devote what time I can spare from my regular business. 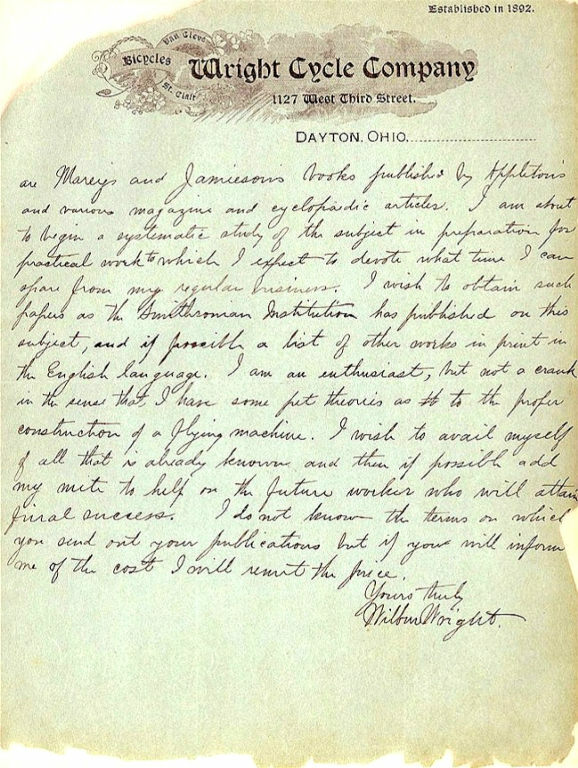 I wish to obtain such papers as the Smithsonian Institution has published on this subject, and if possible a list of other works in print in the English language. I am an enthusiast, but not a crank in the sense that I have some pet theories as to the proper construction of a flying machine. I wish to avail myself of all that is already known and then if possible add my mite to help on the future worker who will attain final success. I do not know the terms on which you send out your publications but if you will inform me of the cost I will remit the price. 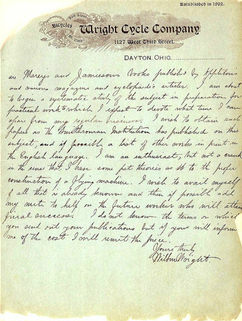 Assistant Secretary Richard Rathbun answered Wilbur on June 22, enclosing a list of publications including works by Octave Chanute, Samuel Langley, and James Means. 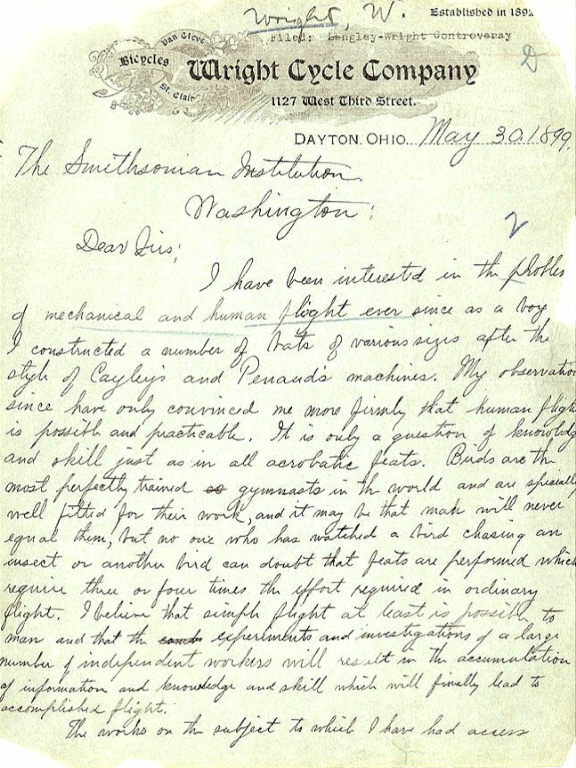 He also sent four pamphlets, including Empire of the Air by Louis-Pierre Mouillard, The Problem of Flying and Practical Experiments in Soaring by Otto Lilienthal, Story of Experiments in Mechanical Flight, by Samuel Langley, and On Soaring Flight, by E.C. Huffaker. 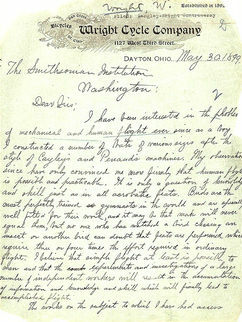 The first page of Wilbur's letter to the Smithsonian Institution.